“Green” Modern Boulder House in Joshua Tree. Seen in Variety, the LA Times, The Week and Angeleno magazines, this ‘green’ home was conceived by Beverly Hills landscape architect W Garett Carlson. The result is notably significant in uniqueness of concept, materials and execution of a structure at one with its environment. Design elements include rusted steel, concrete, glass, desert sand and indigenous landscaping. A faux boulder facade mimics the famous rock faces in nearby Joshua Tree National Park and hides the home from view. 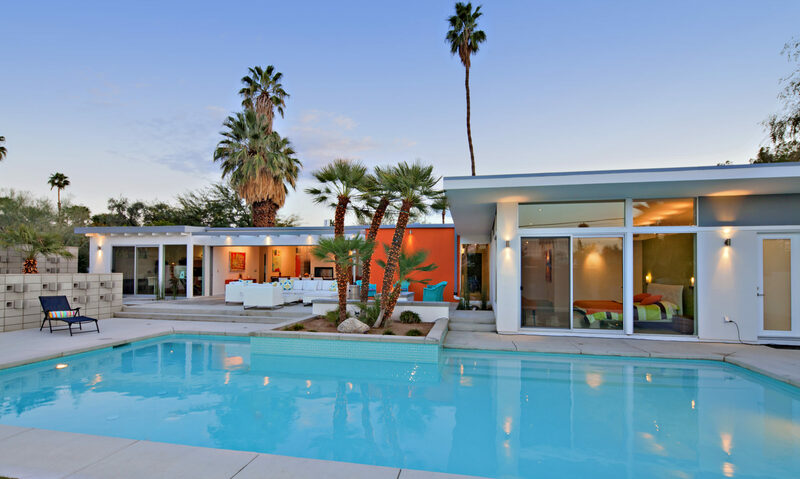 Low energy in-floor thermal warming and cooling is assisted by massively insulated walls, a desert garden on the roof, and the cooler high desert location. Disappearing 10 by 40 foot glass doors completely open the great room to the deck and desert views. Stained concrete floors, CaesarStone counters, upscale stainless appliances, glass tiles, and wood ceiling surround the furnished living spaces. Priced to market, it is well below its 2009 construction cost. Easy driving times to Palm Springs and LA. Nearby 800,000 acre Joshua Tree National Park has granite monoliths that attract visitors and rock climbers from around the world. The town, an enclave of musicians and artists, continues to grow in popularity, with its own music festival, and an eclectic mix of art galleries, antique and curio stores, cafes and design shops. It is home to the annual Joshua Tree Music Festival. The band U2 stayed and recorded in the town to create their legendary album, ‘The Joshua Tree’.